This post shows how, with a voltmeter and a variable DC power supply, a discharged rechargeable battery can be brought back up again without a dedicated charger. Sometimes a battery will be so discharged from non-use that the dedicated charger it came with won’t recognize it and fails to go into a charging cycle. This is the perfect situation to use a variable DC power supply to slowly bring the battery back up to where the charger can again charge it. In my case, the battery charger/power supply for my laptop suddenly failed, leaving me without the use of the computer while I waited for a one to arrive. I brought the battery up with this method until the new power supply/charger arrived. 1) Measure the voltage on the battery with the meter. We need to know the polarity of the battery to properly hook up the power supply. We also need to find a starting point for the recharge. 2) Find a means to attach the power supply to the battery. Alligator clips are the handiest type to have on the power supply output cables for recharging. In the case of the lap top battery it was necessary to use a couple of blade type electrical connectors to slip into the slots of the battery terminals and then clip the alligators onto them. 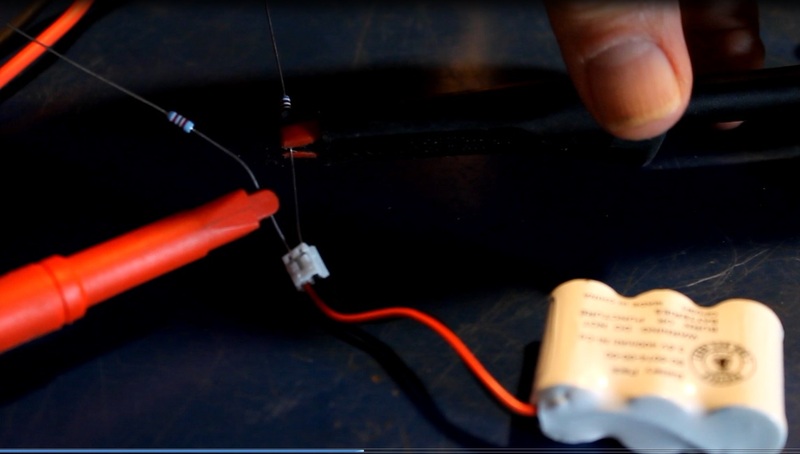 A standard cylindrical battery, such as an AA cell, can be charged using some common wire and attached with electrical tape. 3) Set the output voltage on the power supply. It is best to bring the battery back up slowly and in stages, so pick a voltage three or four tenths higher than the current battery voltage. 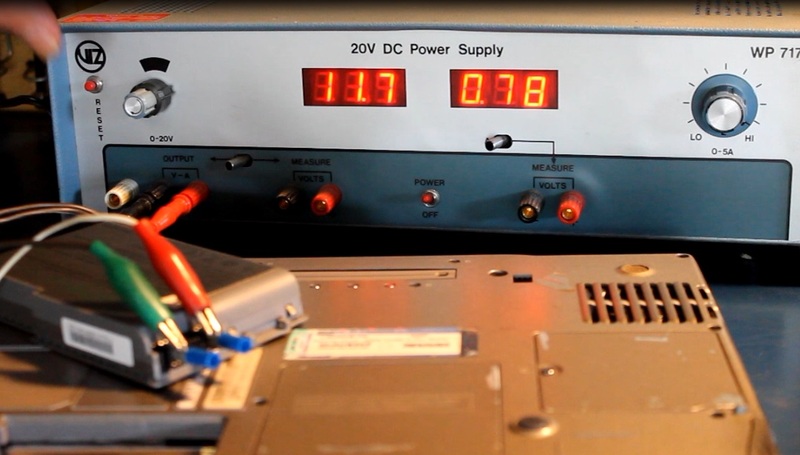 If your DC power supply has an amp meter, monitor that and try for .5 to .7 amps. The further the power supply is set above the battery voltage, the greater the current flow in the charging circuit. This will result in more heat in the battery and stress the battery (possibly shortening its life) and result in a lower quality charge. 4) Clip the power supply connectors onto your battery. Plus goes to plus and minus to minus. 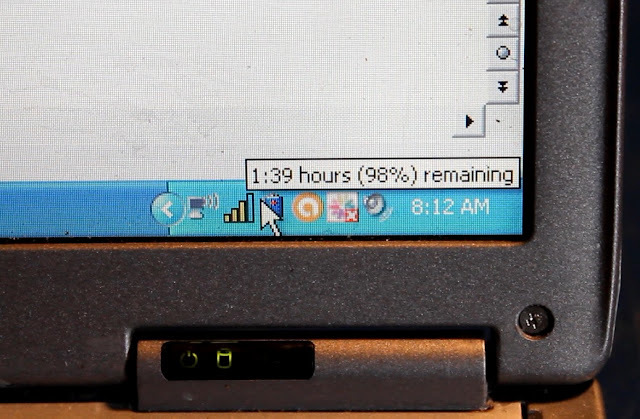 Begin the charge and note the time. Check the progress after an hour and a half. 5) When the battery has reached the first charging voltage, set the power supply higher, again by small increments or .5 to .7 amps if equipped with a current meter. For a full charge go above the battery rated voltage by a few tenths. 6) Reinstall in the device and check operation. Sweet success. Back up and back online! This is a very basic and inexpensive power supply that should work well for the money. I have not used it myself but most of the reviews are good. Actually people looking the dealers for getting proper service because in shop they can’t get the benefits or service in good way but dealers so really know the customers value thanks for this pretty article, keep blogging.